The “Mirror” universe was made famous for Trekkies in the original Star Trek episode Mirror, Mirror. This is the universe where the Enterprise crew encounters darker versions of themselves. 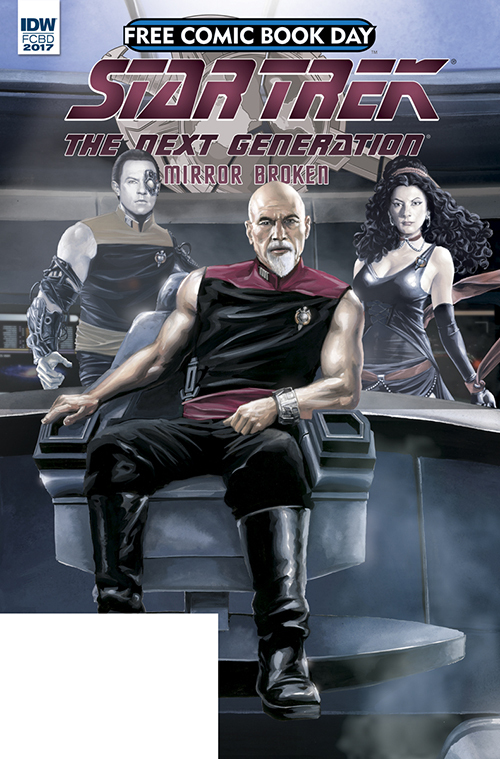 Well this Free Comic Book Day (May 6th, 2017), readers will be able to tag along with the Next Generation crew as they encounter their mirror selves in Star Trek: The Next Generation: Mirror Broken! This free issue will serve as a prequel to a new mini-series launching shortly from IDW where Captain Jean Luc-Picard will stop at nothing to get his hands on the Terran Empire’s latest starship, the Enterprise-D. The Terran Empire is the darker Mirror version of the Galactic Federation of Planets. In the Mirror universe, the federation seeks out new life and new civilizations…to conquer. Free Comic Book Day has an interview with the authors Scott and David Tipton available on their site. Next Lego Compatible Tape Is Awesome!